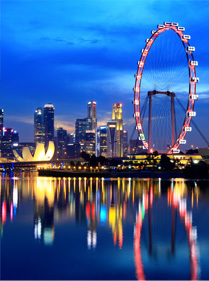 Singapore is unique – a modern miracle in no uncertain terms. Because, never before in human history has a society made such a vast jump in improving the quality of life for its citizens in just under half-a-century. Courtesy its business-friendly government, visionary leaders and hard-working pioneer generation, the city-state is now the business epicentre of Asia attracting corporate entities, business leaders, and investors from the region and around the world. While reasons for this are aplenty, we enumerate just a few. 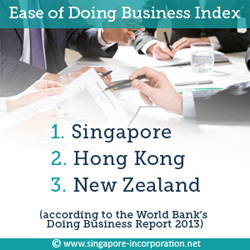 According to World Bank’s Ease of Doing Business Report 2013, Singapore has topped the list for the seventh year running due to its hassle-free business set-up processes. World Economic Forum’s Global Competitiveness Report 2013–14 also ranks the city-state as the second most competitive economy in the world, offering the best IP protection, infrastructure and incentives in Asia. Global Information Technology Report as well as the Economist Intelligence Unit’s Country Forecasts Report are all praise for Singapore’s business-friendly ecosystem, which, according to the country’s Ministry of Trade & Industry (MTI), has attracted thousands of multinational corporations to its shores. As a testimony to the country’s success story, many of these MNCs have chosen to incorporate in Singapore and set up their Asia-Pacific headquarters here. 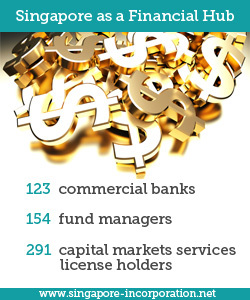 The city-state is home to 123 commercial banks, 154 fund managers and 291 capital markets services license holders, which enables entrepreneurs to raise funds at rates as low as 1% per annum. The Singapore Exchange (SGX) is also the fourth largest forex trading centre in the world. The city-state’s personal tax structure is progressive with marginal rates ranging from 0 – 20%. But the framework allows residents to tap various reliefs, thereby lowering their effective payments. A unique Not Ordinarily Resident (NOR) Scheme is also in place, which grants a favourable five-year tax treatment for qualifying individuals working in Singapore. Such individuals are employees of a Singapore registered company earning at least S$160,000 per annum. If these individuals spend at least 90 days per year outside Singapore for work purposes, IRAS doesn’t tax them on the income of the duration spent outside Singapore for business. 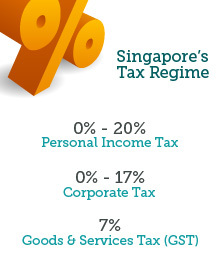 As regards to the corporate taxes, while Singapore’s marginal rate is already the third lowest in the world, the effective tax payable comes out to even lower if one takes advantage of all the government incentives, subsidies and schemes. For instance, through its enhanced Productivity and Innovation Credit (PIC) Scheme, the Singapore government has made it possible for a firm to not pay any corporate tax even if it earns as much as S$28 million annually by offering tax credits for qualifying activities. Singapore is right in the midst of emerging markets such as China, India, Indonesia, Vietnam, Thailand and Myanmar, giving companies based here a strategic advantage over its competitors. Also, with the world’s best airport – Changi International – serving over 80 international airlines connecting people to more than 190 cities in 160 countries daily, as well as hosting many leading logistics firms such as UPS and FedEx, connectivity is never an issue. Additionally, Singapore has signed over 20 Free Trade Agreements (FTAs), and 74 comprehensive and 8 limited Avoidance of Double Tax Agreements (DTAs), facilitating trans-border trade and making it cheaper for Singapore-based firms to expand their operations internationally. While Transparency International’s Corruption Perceptions Index 2013 has rated Singapore as the least corrupt Asian country, aberrations are given exemplary punishments. Anti-corruption laws are tightly enforced so that entrepreneurs can conduct their businesses without any bureaucratic hassle or red-tapism. 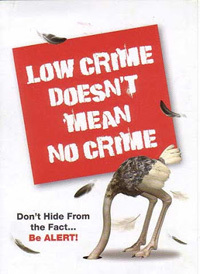 Singapore’s legal system is considered as the most efficient in Asia, with crime rates so low that the government needs to keep reminding its citizens not to lower their guard altogether with signs [with captions such as “low crime doesn’t mean no crime”] posted all over the island. As demonstrated by Mercer rankings over the years, Singapore has proven to be the favourite city in Asia among expatriates due to its relative stability, low pollution levels, familiarity with English among the general masses, wealth of public services and recreational provisions. With world-class medical facilities, good public transportation, varied options for housing and education, the multi-cultural city-state is also an excellent choice for raising a family. So once you have made the right decision to set-up a company in Singapore, what are the next steps? If you are a Singapore resident, the registration process is fairly simple. But, first you need to determine which business structure, among the ones permitted in Singapore, will meet your requirements.